wireless analog and digital cameras and other wireless device during 50 MHz ~ 6.0 GHz. Eliminate the environment interference to set the detection threshold. Adjust to shorten detecting distance for locating and finding signal source. Hunting all the Cell phone, Wireless phone. 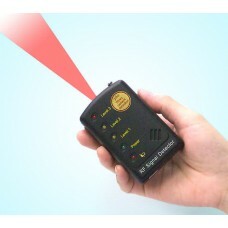 Dual strength indication: Audible / LED alarm.